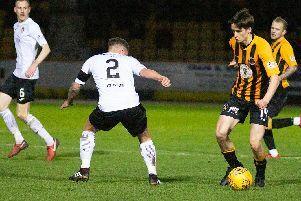 Berwick’s run of poor form continued when they went down to a 3-0 defeat at home to title challengers Clyde at Shielfield on Saturday. The Bully Wee were in control throughout and took the points with two first half goals from Chris McStay and David Goodwillie and a last minute free kick from John Rankin. The visitors were first to show their hand with John Rankin firing in a shot from outside the box after only three minutes which Kyle Allison did well to push away. And after a period of sustained early pressure the opening goal came after nine minutes when a free kick from Rankin was spilled by Allison and McStay followed up to net the loose ball. Goodwillie and McStay then both had shots off target from outside the box as Clyde continued to press. On 23 minutes Berwick made a claim for a penalty when Lewis Barr went down on a run into the box, but referee Barry Cook waved their pleas aside. After 26 minutes the visitors had a great chance to extend their lead when Goodwillie headed over from only two yards out after a corner was headed back across the goal to him following a corner. Craig Hume headed wide for Berwick from a corner whilst at the other end Allison saved well from Rankin before Clyde doubled their lead on 36 minutes when a ball was slipped through the middle and Goodwillie slid it past Allison. 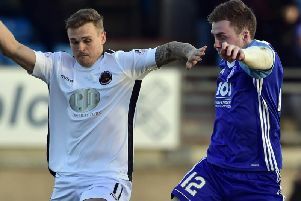 Just four minutes later Goodwillie had a chance to make it three when Berwick failed to cut out a through ball and the striker ran through, Allison pushing his shot onto a post before going out for a corner. Early in the second half Clyde again pressed from the start. McStay had a shot saved by Allison and Jordan Orru had to clear another attempt off the line. Goodwillie also pulled a shot wide on the break whilst McStay had a long range effort parried by an overworked Allison, but they were unable to add to their tally until the 91st minute when Rankin fired in a free kick from 22 yards.